That is what this is all about right? I had gotten an email from a blog reader who couldn't believe I would promote another blogger's journal class. "It is going to take away money and clientele from you if you want to ever teach another journal class." First of all, I love Elaine, she inspires me, and I love the fact that she is teaching a journal class. 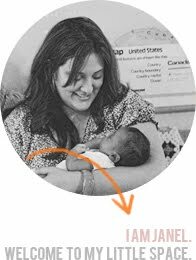 Second of all, I don't teach these classes to gain clientele, I do it as a creative outlet, to create friendships, and to raise money for our adoption. The crazy thing is that this whole email sounded so so familiar. When I taught my very first journal class, I received an email from a blogger that I looked up to so so so much. This person was someone who I considered a role model, a creative genius and most importantly, a friend. This person was so "disappointed" in me for teaching a journal class and accused me of "trying to steal her clientele" and "posing a threat to her online business." Apparently this person thought that since she taught a journal class before me, that no one else could ever do it, which is silly because a ton of amazing people teach amazing online journal classes. So many people have so many different things to offer and I love being inspired by loads of creative people. In the end, it was a huge blow-out, a friendship lost. In retro-spec, I'm pretty sure that I was never a "friend" to this person, just a client and someone who supported her online endeavors A LOT. It was one of the most disappointing, and heart breaking things that I have encountered during my blogging journey and I have learned from it. I still think this person is amazingly talented, and although I was hurt so much by her words and actions, I still find myself excited for her and her successes. The reason I share this is because I just want to encourage everyone to be nice! 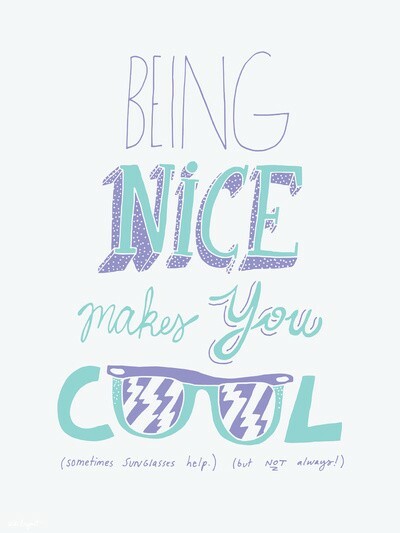 Being nice makes you cool!!! I come here because it's a lovely place to visit. No jealousy, no drama. Honestly, you are a sweetie-heart and I pretty much love you to pieces and I completely agree with you and your perspective! You have such a big heart and truly care about the goodness of all things and this is just another way of you showing that! You are so supportive of the crafting and blogging community, so you get down with you 'Nice' self!! love ya! Since I know some of the details of the situation that you are talking about and the mean things that your former pseudo friend said and did to you I can't help but be biased BUT I think you are an amazing person and such a great friend who is always willing to help others out. If every creative blogger acted like you I think that we would have a more empowered and tight knit community. I know because I went through something similar with another blogger a while back. That's why I'm way too cool! agreed on all levels. stay true to who you are, & let the rest just be background noise, lovely janel. I agree with you 100%. I don't know who was upset at you but,the reason I love the bloggin community so much is all creativeness and inspiration that can be found. I don't know why the negativeness has to be spread around. Keep on doing what you have been doing girl! I love it and you! This made my heart swell! I love when I hear about kindness being spread instead of negativity! I think I know who you're talking about and that's just silly way to go about it. If it's who I think this person is they have pretty much abandoned this type of creating anyway. And your classes are a lot more affordable, which is REALLY nice. I'm so sorry that happened to you. I think I know who you're talking about and I'm disgusted. She's lost my business. You're such a creative, sweet person. I'm proud of you for taking the high road. There is no room in your life for a grumpy gus. I love your classes, and you have always put them together ever so nicely. Wow, Go you for supporting Elaine, and keeping positive! There are jealous Debbie Downers out there, but know that you are awesome, and I think that you are great for staying positive and friendly!! I know the situation you are talking about and can not believe that someone would take it as far as this other blogger did. Everyone has the right to have a journal class and I feel there should be more classes out there so we can take them every month. Everyone has so many unique diff ideas which I love. It is the ones that are the same themes that aren't worth the class effort. Your first journal for Pita class was so much fun and you pulled me into doodling which I never thought I could do. Now I doodle more all the time. I hope you do another unique journal class soon. I am going to take the May Art Journal class and am so excited for it to start! Just like Kam's 30Days of Lists..oh my gosh I hate lists and took this class and it was nothing like I thought it was gonna be and so glad I took it. I looked at doing lists totally diff now and was sad when the class was over.